There is a problem with a new member of my household, the Xbox One. With that statement, many people are probably thinking that my husband is playing too many games or that the system is taking up too much of our free time. That is not the problem at all. We hardly have any free time to play games, and when we do the other person is usually asleep. J plays at night when I am sleeping and I wake up early and play on the weekends before anyone else is up. L gets to play when he is being good and we are there to monitor his controller use (he is a little rough with it still). No, the problem is with one of the coolest and newest features of the One; the automatic sign in. My Xbox is sexist. Yep, you heard me right. Ignore whatever commercials that you may have seen; my Xbox has a distinct preference for men. It can see and sign in J before the home screen even appears, but I can sit in front of it (with perfect lighting) and not be recognized for 10 minutes. Yes, I have told it to recognize me in many different situations of hairstyle and lighting. For some reason, it just does not want to see me; this is really frustrating because I actually end up playing the Xbox more than J (either gaming or Netflix/Hulu). It doesn’t end there either. The voice commands are not working for me either, but they work fine for J. That one is particularly frustrating when trying to start Netflix but not wanting to grab the controller that you just hid from your 2 year old. The Xbox even picks up L’s voice over mine, so it cannot be the pitch of the voice because his is even higher than mine. I am at a loss for what to do about this. Do I need to have a harassment seminar for my Xbox? I hope that an update comes through soon with a fix for this problem. Until then, my Xbox and I are not on speaking terms. This entry was posted in Gaming and tagged nablopomo dec 2013, sexist, xbox on 2013-12-03 by Jill. Xbox Live has a new online multi-player gaming idea. They get the players to participate in huge live game shows that are scheduled to air during “prime-time TV”. The only game that is currently being offered is 1 vs 1oo and it is still in beta. What this means is that if you have an Xbox Live Gold account, you can join in on the beta and maybe win some prizes. To play the game, you select it on the dashboard and enter the lobby. Once you are there you get partnered up with 3 other players and then get sent into the game. You can get placed in the Crowd, the Mob, or as the One. The object of the game, if you have never seen it on TV, is for the one person to “knockout” all the mob members by getting all the questions right as the mob gets them wrong. Hence the One vs 100 (the mob). If the One wins, they get MS Points and/or game download credits. If the One answers wrongly the Mob gets to split the winnings between whomever is left. At certain times the One can take the money and run; which is pointless in the beta because they are not using real prizes right now! Sorry, that drives me nuts!! If you are playing in the Crowd, you get to answer the questions to improve your stats and win a small prize if you are in the top 3 for score. On to the fun stuff. You get chosen as the One or Mob by having a quick answer time and a high correct answer percentage. I like this method of selection because it ensures a competitive game that goes on for a while; but I do not like it because I will probably never get selected with my 82% correct answer rate and 1.2 second time to answer. Even though I will always be in the crowd, I enjoy playing this game with Jack and laughing at some of the people that I see playing. What is the 24th letter of the alphabet? What is the scientific name for the study of birds? Where was the Indy 500 race held from 2002-2008? Who of these was never married to Madonna? In what city would you find the Prado Museum? How many numbers are on the XBOX 360 controller? Remember that all of the questions are multiple choice, I just can’t remember them all to list them here. As you can see, it is a wide range of subjects. Currently there is one Live game offered Fri and another on Sat for 2 hours of game each. On the other days there is Extended Play where everyone is in the Mob just answering questions. This is where you get the chance to raise your rankings to be selected for the One or Mob in the Live game. There is also going to be special themes for the Extended Play sessions such as: community written, he said – she said, and current events. Personally, I enjoy playing this game and have encountered no bugs so far. Finally, the reason to play the beta; for each answer you submit you get an entry into a sweepstakes drawing. The top prizes are a TV or a laptop or a Zune. Not a bad reason to play a game that requires no commitment other than a little time, right? I think that this is a great way to be interactive couch potatoes rather than a standard vidi-it! Nothing will stop people from sitting on the couch in the evening and staring at the TV, but maybe this will encourage socialization with those sitting in the same room. Wishful thinking, I know. This entry was posted in Gaming and tagged 1 vs 100, beta, live, primetime, xbox on 2009-06-23 by Jill. Hello and welcome to the New Xbox Experience (NXE)! I have been waiting for this update for about 3 months now, and I am loving it. 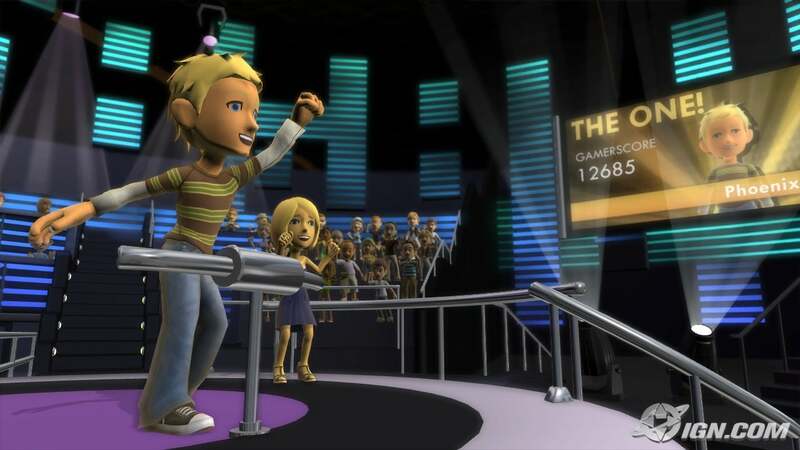 The new interface and avatars seem to put the 360 somewhere between the Wii and the PS3 when it comes to target audience. Microsoft is deffinately trying to get that crowd of casual gamers on board. Jack does not like the avatars, being too Mii-like for him, but I spent about 2 hours working on mine and his. I only wish that they had more clothing and hair options. There is a predominace of straight hair styles, which does not work for those of us who have curly hair. There are 2 true curly hairstyles, and both of them look like frizzy triangle heads. 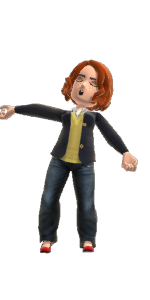 The current hairstyle on my avatar is as close as I could get, and my hair is about twice as long as that. There are not many long hair styles either. I am anxiously awaiting the first pack of DLC for the avatars. I am hoping that it will be free, but i highly doubt it, knowing Microsoft. The Netflix capabilities of the NXE are simply awesome. Now I can watch something on my TV even if my discs get delayed in the mail! Boo for Sony not taking the higher ground and allowing their movies on the Netflix Watch It Now. The only irritating part of this is that you have to set up a queu of movies to stream to your 360. No browsing from the console. Oh well, this is not a major issue, and I always have a computer on in the house for one reason or another. Another feature that I am enjoying is the ability to delete the 0 Gamerscore Games. This has really helped increase my completion percentage, and has asthetically improved my gamerscore. Those 0’s just looked ugly! I have not had a chance to try out the party capabilities with my friends yet. Nor have I been able to play a game that utilizes my avatar. I am looking forward to playing the new Scene It: Box Office Smash with my avatar. All in all, I think that this was a good move for Microsoft. It gives their system a whole new look and feel, without them having to produce a new system! Even though people have been complaining about the themes not looking great on the NXE, my favorite old theme looks great (Think Blue by Disruptive Publishers). With avatars to play with, and a faster, easier to navigate interface, I give the NXE 4.5/5 stars! 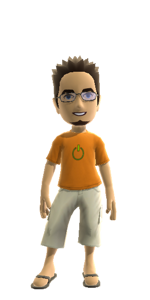 This entry was posted in Gaming and tagged avatar, gamerscore, microsoft, netflix, nxe, xbox on 2008-11-21 by Jill.